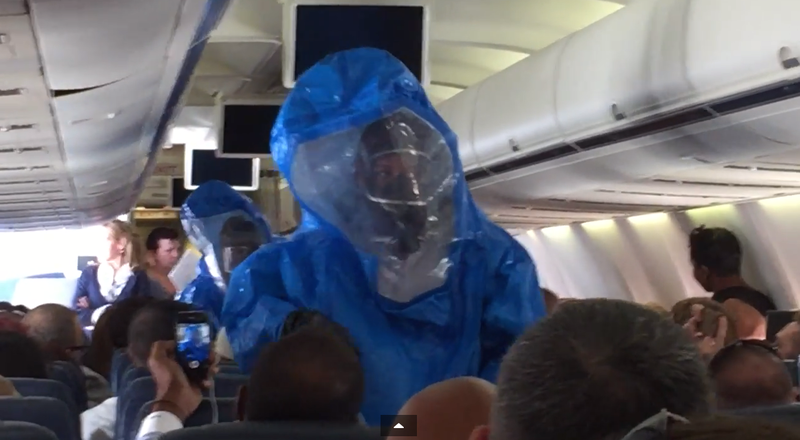 Ebola joke prompts hazmat team to board plane. Hazmat team responds to passenger Ebola joke on US Airways flight. Ebola, as we all well know, is no laughing matter. And topics that are generally not considered good-humored elsewhere are almost always doubly unfunny on airplanes. So when a passenger shouted what appeared to be an attempt at Ebola-related humor on a US Airways flight on Wednesday, authorities weren’t laughing. They isolated the plane and sent in the hazmat team. Fellow passengers recorded the incident. What triggered the full-on response on the flight from Philadelphia to the Dominican Republic isn’t totally clear. * “Initial reports by the Dominican press and on social media said the passenger had yelled, ‘I have Ebola!’” according to the Fox News Latino. Whether or not that is actually the case, and it appears that it is not, “an unidentified passenger traveling from Philadelphia to Punta Cana yelled out, ‘I’ve been to Africa!,’ just before US Airways flight 845 landed on the Caribbean island,” an airport official told Fox News Latino. Emergency personnel wearing blue hazmat suits boarded the plane and the passenger was taken to the airport’s medical center for tests. The passenger, who officials have only identified as a man from North America, was reportedly coughing during the flight. Medics verified that the passenger did not have a fever – a key early symptom of Ebola. Paola Rainieri, vice president of marketing and communications for Grupo Punta Cana, which owns the airport, told FNL that the airplane was held on the tarmac for nearly two hours until medical and airline officials determined there was no risk to the 200-plus passengers… Rainieri described the incident as a “joke of poor taste” by the passenger, who had not traveled to Africa recently. According to Rainieri, the man’s passport showed that the last trip he had taken anywhere close to Africa was a 2012 trip to Europe. Rainieri later released a statement saying the man tested negative for Ebola, according to BuzzFeed. Read more of Slate’s Ebola coverage. *Correction, Oct. 10, 2014: This post originally misstated that the hazmat team responded to an Ebola hoax at an airport in Puerto Rico. The incident occurred in the Dominican Republic.